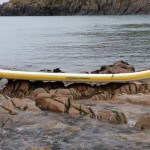 C4 Waterman BK Pro 10’9″ – £799. 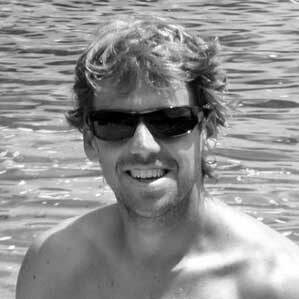 This year sees the return to the UK of C4 Waterman after a few years with no real presence in the UK SUP scene. 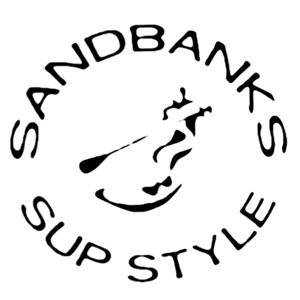 The Canoe and Kayak store are bringing a number of boards into the UK and SUPboarder have the BK Pro 10′ 9″ inflatable SUP for a test. 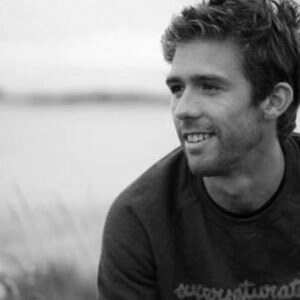 C4 Waterman BK 10′ 9″, stable confidence inspiring iSUP. For those new to the brand C4 stands the Core 4 values that the brand is built around; Balance, Endurance, Strength and Tradition. 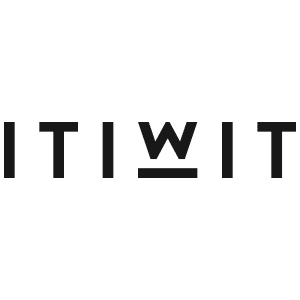 There’s more information about the company and their ethos here, for the SUPboarder team it’s good to see the brand back in the UK. One of the company co-founders, Brian Keaulana, lends his initials to two of the C4 Waterman range of iSUPs, the BK Pro 9′ 10″ and BK Pro 10′ 9″. Inside the box the arrived at SUPboarder HQ contained a bright yellow bag, board, pump with gauge and hose, in yellow of course, 3 FCS twin tab fins a branded FCS Allen key and a repair kit. The board is what we’ve come to expect for a modern iSUP. It is made from double wall PVC drop stitch fabric, C4 make a point that their boards are not just glued together but that they are also sewn. This, they say, makes them tougher and stiffer. The maximum inflation pressure is 17 psi, for the SUPboarder deflection test we inflated to 16 psi and recorded a deflection of 16mm, for information about the SUPboarder deflection test check the video at the end of this review. 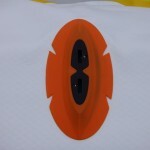 The outline of the board is not typical for an iSUP which makes it stand out from the crowd. From the conventional pointed nose the board slowly fills to the maximum width of 32.5″ although it looks slimmer than that. Before the squared off tail there’s a step in the profile, this is in line with the two side fins. On the deck there are three handles, two BOP style grab handles in front of the deck pad and one central handle, all three are fabric and easy on your hands. There is a bungee on the deck for cargo secured with four adhesive fabric loops and there is a leash attachment point at the rear behind the valve. 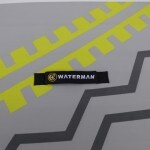 The deck pad is in two parts, the main part is smooth wth a subtle zig zag graphic, this symbolises the connection between the islands of the brands homeland. There is a kick pad at the rear that’s shaped around the inflation valve, this has a diamond grip which is very grippy. 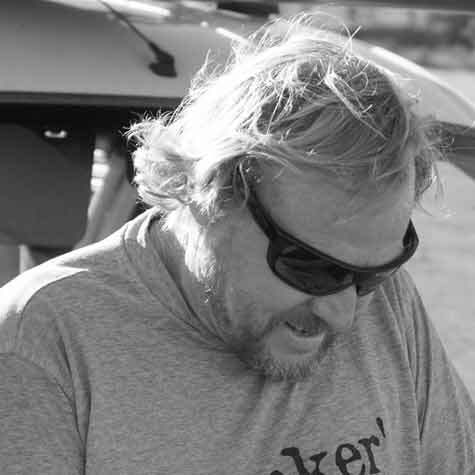 The kick pad seems a little far forward but it is directly above the middle fin in the three fin, ‘thruster’ set up. 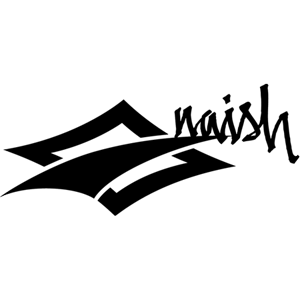 Unlike many iSUPs off this length C4 have specified rigid, replaceable fins not the usual flexible fluid on fins that are commonplace in all round designs. The three fins are FCS twin tabs that are attached to the board with C4’s ‘cuttlefish’ FCS fin boxes, these allow a paddler to change fins as their paddling progresses and give the option of running no fins in shallow water or for some entry level whitewater paddling. 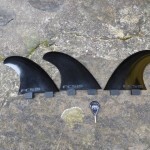 The fins are easy to install and remove with the supplied key, the two side and one centre fin all the same size but they do not have the same profile so need to go in the right box. If coming from other inflatables of this size with fixed fins be careful with the the threads and grub screws and don’t lose that key, the bag could be improved with somewhere to keep that key safe. The supplied fins are hard nylon which should give better performance than fixed flexible fins and mean that the board rolls up smaller than comparable iSUPs, it is therefore easier to fit in the bag. 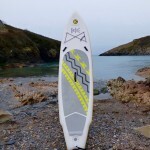 The three fins supplied are same size, OK for surfing but this board has a split personality and for cruising or carrying a load a larger centre fin would have been a great inclusion with the board. The inflation valve is a standard design allowing any number of pumps to be used, handy if travelling with a group so pumps can be shared. 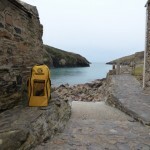 The pump supplied is a low volume, high pressure variant from Bravo, brilliant for travelling as it fits in the bag with no fuss at all but there are faster ways to inflate the board if you don’t need to move board and pump in the same bag. Bag is old school for an iSUP, simple and light with no wheels, wide straps, a chunky zip and external mesh pocket for the fins. It’s also very bright and would be hard to miss in transit. The first thing you will notice with the board inflated is the emphasised rocker at the nose, more on that later. 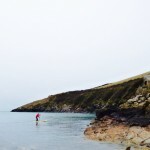 Pumped up to 17 PSI the BK Pro 10′ 9″ dealt with me (100kg) and Magnus the SUP dog (35kg) reasonably well on our first paddle in the beautiful bay of Port Quinn in North Cornwall. There was some flex but that’s to be expected as combined we are at the top end of the weight limit for the board. Given that the board appears to be made well I can see no reason not to use a higher PSI for a stiffer ride. The rocker is ‘exaggerated’ when compared with other inflatables that are aimed at general use, it’s quite like the white water iSUPs from other companies. 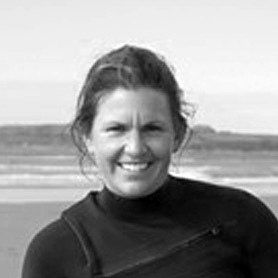 In use on a calm day with a gentle rolling swell there was no noticeable drawback to the shape. 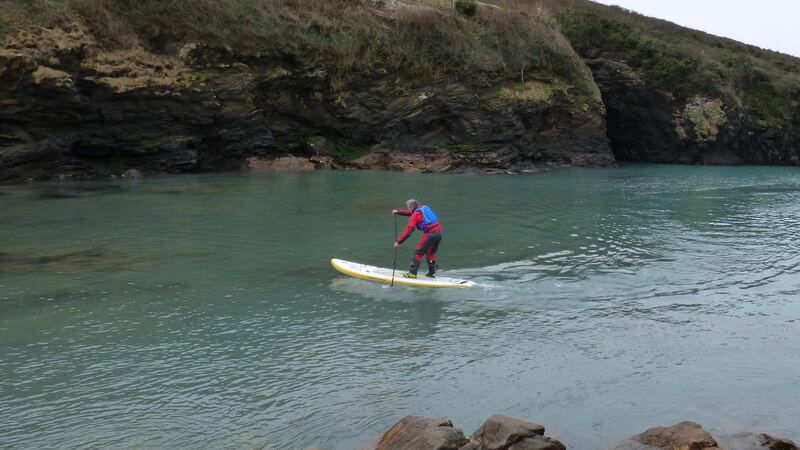 The rocker means that turning the board is really easy, step back a little and turn on a sixpence which is great for exploring a rocky foreshore. 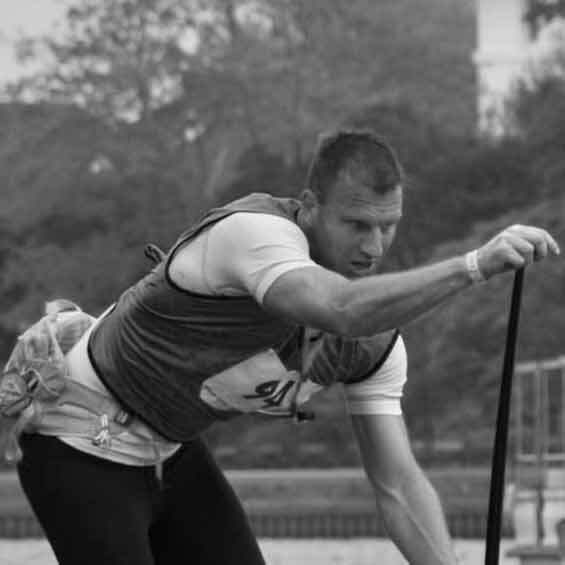 The shape will flatten slightly when carrying a load so what initially seemed a little strange seems to be a pretty good idea when on the water. The unusual shape of the tail gives the impression that it is narrower than most. But again looks can be deceiving and it’s of comparable width to other popular iSUPs. 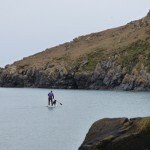 When paddling on flat water it is very stable when pushing the tail down to make a quick turn, possibly because the kick pad is further forward than expected. 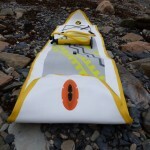 Pros Good looking, well made iSUP that will suit many paddlers who want one inflatable board for any occasion. Cons Main deck pad shows marks easily, needs a longer centre fin. 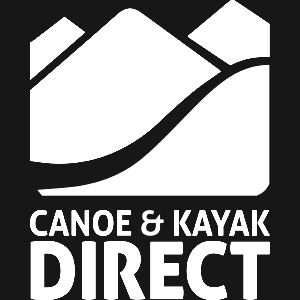 Available from The Canoe and Kayak Store. 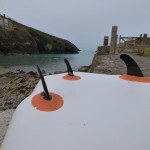 Overall this is a good inflatable board, at 10’9″ long it is, on paper, slightly longer than similar boards but that extra length is lost on the water because of the nose rocker. 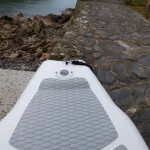 It is stable, well made and would make a great family board or versatile board for the larger paddler. The fin set up says ‘Surf’ but the bungee says ‘Explore’ and the rocker says ‘Play with me and carry a picnic for the family’ making this a board for all conditions. To compare the BK 10′ 9″ with other boards check out the SUPboarder Equipment Guide.